Contracts also includes a rolling graphic organizer that unfolds as students work through the text, as well as exercises designed to build students self-directed learning strategies. The Teacher¿s Manual includes PowerPoint slides keyed to the text and dozens of multiple choice and essay questions (with answers and explanations). 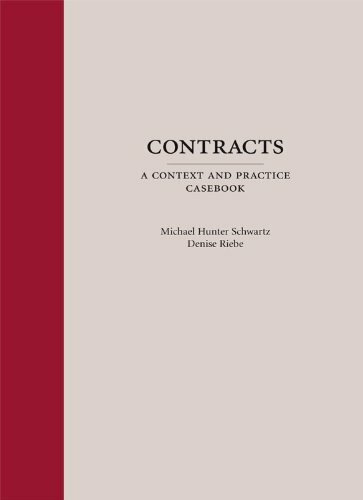 This is the first book in the Context and Practice Series, edited by Michael Hunter Schwartz, Washburn University School of Law. Michael Hunter Schwartz is Dean and Professor of Law at William H. Bowen School of Law at the University of Arkansas at Little Rock. Denise Riebe teaches at Duke University School of Law and is an adjunct professor at the University of North Carolina School of Law. She has served as the Director of a national bar review company, and is the founder and owner of Pass the Bar!, a bar exam coaching and consulting company.